Come learn the old Appalachian art of split oak basketry. Taught by the masters themselves, Peggy and Chuck Patrick, this is a weekend not to miss! 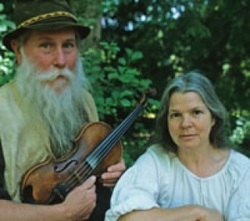 After supper on Saturday these two are likely to pull out their banjos and fiddles and liven things up a bit! Everyone will go home with a beautiful finished basket which will no doubt be cherished for a lifetime (or more!). Cost: $150 this includes the two day workshop, farm fresh local organic meals, and lodging. IF YOU CAN'T MAKE IT FOR THE WORKSHOP PLEASE COME BY FOR SUPPER AND LIVE OLD TIME MUSIC SATURDAY EVENING 6:30-9:30PM $15 SUGGESTED DONATION.